If all goes as scheduled — and both India and Japan are moving ahead with increased confidence — the regional systems will substantially enrich the world’s positioning, navigation, and timing (PNT) resources. IRNSS should be completed this year, with seven satellites on orbit. QZSS will have four satellites up by 2018 and seven by the end of 2023. But India and Japan have their own augmentation systems in GAGAN (GPS-Aided Geo-Augmented Navigation) and MSAS (MTSAT Satellite-based Augmentation System), respectively. QZSS and IRNSS, in contrast, are essentially autonomous systems that literally operate outside the orbits and frequencies of the world’s four GNSS systems. These are not trivial considerations. As last year’s disappearance of Flight MH370 reminded us, the Indian Ocean region in which IRNSS operates is large and largely unchartered. So, too, the Western Pacific surveyed by QZSS. Having expanded GNSS resources available there will bring benefits to nations well beyond those providing the regional services. 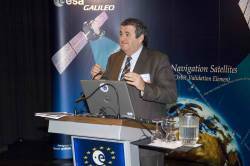 Broadly speaking, regional systems do augment GNSS services, it’s true. But they also move beyond them, bringing their own distinctive characteristics and technological opportunities. QZSS’s L-band Experimental (LEX) signal — to be renamed L6 when QZSS becomes fully operational — is designed to transmit correction messages that enable positioning, navigation, and timing applications that require centimeter-level accuracy. The L6 signal (at 1278.75 MHz) will incorporate Geo++ State Space Representation (SSR) technology in which relevant ionospheric effects are estimated in real time using reference network observations, making these suitable for single-frequency GNSS receivers. Similarly, IRNSS transmits a unique hybrid data structure at L5 (1164.45–1188.45 MHz) that provides grid-based ionospheric corrections for single-frequency users, as well as a ranging signal on S-band (2483.5–2500 MHz) — a relative novelty for GNSS systems. The QZSS program also attempts to address another challenge: the need for indoor PNT capabilities. The ground-based IMES or the Indoor Messaging System uses pseudorandom noise codes (PRNs), operates in the L1 frequency, and has message formats compatible with QZSS and GPS. Beyond their technical distinctiveness, regional systems ensure a relatively greater control over strategic national assets and the critical infrastructures and applications that rely upon them. This, in turn, strengthens the sovereignty of nations that possess and operate them. Both Japan and India are full members of the International Committee on GNSS Providers Forum, along with the “Big Four”: the United States, China, Russia, and the European Union. They have earned their places at the table.